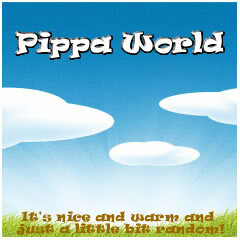 Pippa World: The dream and the reality. With Emma's wedding possibly being next June that gives me roughly 10 months until it is the last possible second to go shopping for a bridesmaids dress. I can lose a stone in about six weeks by diet alone so with exercise lets say that means a stone a month. That's ten stone I can lose right there. That's how much I want to lose. With such an important event as the end goal, and knowing I need to stand next to the super slender Vic, it's almost certain that I would be extra focused, extra dedicated, extra... oh who am I kidding? Emma will morph in to brideszilla in about two months time and that 10 month weight loss plan is nothing but a dream and also if I lost a stone a month it would be a sign of the end of the world and I don't think I want to be responsible for that. Emma would never forgive me. So what's a girl to do? Well, this girl is going to really start pushing herself with harder daily exercise, with a renewed concentration on her diet and paying more attention to The Biggest Loser. No longer will I sit on the sofa with a snack taunting the contestants... right now I am so fired up I will even start going swimming again! I will lose weight. I want to lose weight. It might not be the ten stone, but it will be a start. Fantastic and realistic! I wish you all the luck in the world. With a positive attitude like yours I know you will reach any goal you set. @Fro' Fashion Fairy, I think I love you! @Emma ah Em that's sweet of you but I needs to lose this weight lol. I've got to lose 5 stone before we start trying for a baby (I had all sorts of health problems during my last pregnancy and blame my emergency c section on my obesity) so have started a Very Low Calorie Diet. I've lost 8.5lbs in a week! It doesn't work for everyone but I find it better than a normal diet as I am more focused when I'm replacing meals with shakes/bars. However you do it, good luck. It's not easy but it's worth it!